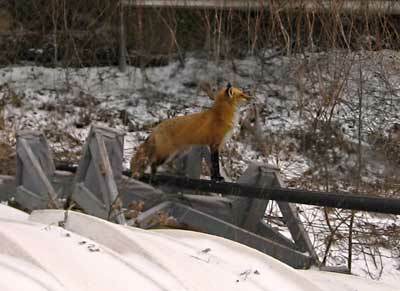 A fox at my boat club. 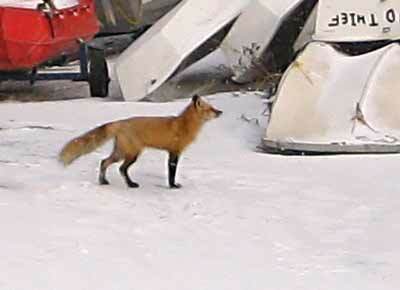 While checking my boat after a series of snow storms, I found a red fox exploring the boat club. After taking a good look at me he decided I was nothing to worry about and allowed me to follow him. He checked out the dinghies carefully. There are always mice living under them in the winter. 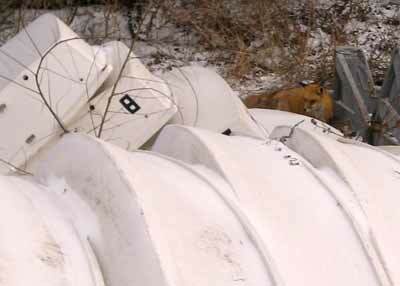 When the dinghies are moved in the spring, there are lots of little tunnels in the dead grass and little holes. This winter has been long and cold with lots of snow and ice. He had figured out where a meal could be found. The fox spotted a squirrel and tried to catch him but was too slow. 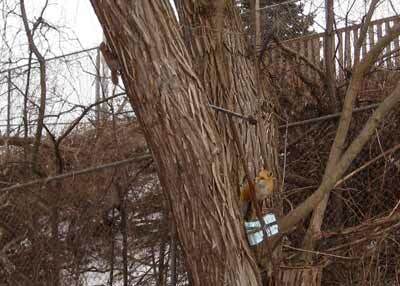 The squirrel gave him a piece of his mind. Lots of ice this year crunching away. 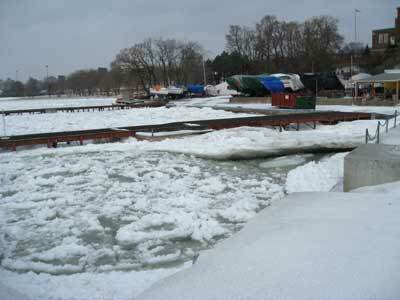 There is a tremendous amount of ice in the harbour this year. It's rough on the docks. Posing with his nose in the wind. He occasionally looked at me but did not show any alarm. He sniffed and listened for any little sound. I was only carrying a small camera with no zoom. I had to get as close as I could but he was very patient with me. He even posed very dramatically on a trailer. There are always ducks and geese as well as lots of mice so I guess the hunting is good around the club. Lucky for the birds lake Ontario does not freeze solid as some of the other lakes do. This year had more ice than I've ever seen though. The ice was solid behind the breakwall but open beyond.